With over 200 million customers in 79 countries around the world, Spotify is by far the world’s largest paid music streaming service. A key driver of their success? Spotify’s Discover Weekly feature. Behind the scenes of Discover Weekly is a recommendation engine which analyzes what you listen to and recommends unfamiliar songs, and it has an uncanny ability to find new music that truly matches your tastes. 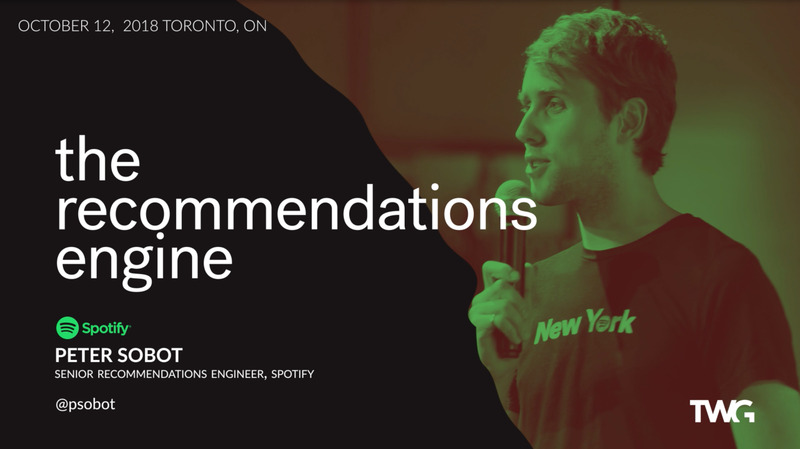 Former TWG software engineer Peter Sobot is a Senior Recommendations Engineer at Spotify in New York (yes, we build great engineers, too). He was recently back in our studio to share his knowledge and insights on the math, the 40-dimensional vectors, nearest neighbour lookups and machine learning concepts behind Discover Weekly. It’s pretty cool. And if you’re interested in digging deeper, the links below will point you to some of the open-source code libraries Peter mentions in his talk.